Welcome to summer, WMXM! 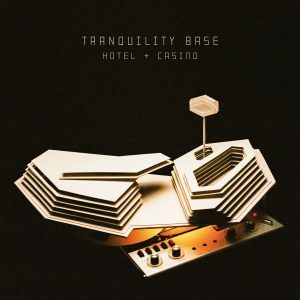 Earlier this month, the Arctic Monkeys released their newest (and possibly most highly anticipated) album. After a five year hiatus, frontman Alex Turner and the band released 11 brand new songs. Many people find themselves listening to the Arctic Monkeys music for their “bangers”, as the kids say these days, but their newest album puts out a distinctly different kind of vibe. The way I’d describe it would be if the sound and aesthetic of No. 1 Party Anthem (off of 2013’s AM) were brought into a dream-wave state and expanded into a whole album. On the whole, it’s a bit of a different sound than what we’ve seen from albums in the past, and that’s to be expected! It’s been five years, and I’ve gotta say that this album brings the Arctic Monkeys back into the spotlight in a super different way. On a scale from 1 to 10? I’m gonna give this one an 8.5 overall, and I haven’t even heard it on vinyl yet. Why? Don’t get me wrong, it’s a great new sound. Give it a chance! Seriously. If it’s been a while since you’ve listened to Arctic Monkeys, go check out this album. It does not disappoint. ← Interview with Paul Cherry!